Source of atmospheric carbon sequestration back into soil. 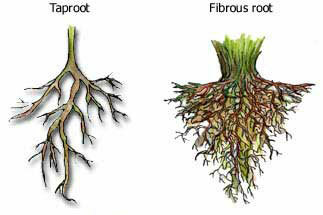 In general, RSA can be simplistically divided into two types, tap and fibrous root systems. Dicots generally possess tap root systems, comprised of a single embryonically-derived primary root (PR) followed by the development of post-embryonic lateral roots (LRs). Examples of dicots include the model plant Arabidopsis, along with mango, apple, roses, potatoes, pumpkin, spinach, and coffee. In contrast, monocots possess a fibrous root system comprised of multiple embryonically-derived PRs followed by the development of Seminal Roots (SRs), post-embryonic shoot borne root and LRs. Examples of monocts include wheat, maize, rice, bananas, grasses, and palms. The RSA is determined in part by the genotype of the plant and is greatly influenced by the environment of the growing root. This environment includes soil texture, watere, nitrogen, phosphorus, and signals and metabolites provided by members of the soil microbiome that associate with the growing root. Although bulk soil not in contact or influenced by roots contains an incredibly diverse microbial community, the microbial community associated with plant roots (the rhizosphere) is much lower in diversity but significantly higher both in overall population numbers (1010 – 1012 cells per gram rhizosphere soil) and specific subsets of the bulk community. The root plays the major determinative role in deciding which members of this surrounding microbial community are recruited to the rhizosphere due to its effects on the surrounding soil and by the release actively or passively of root secretions, commonly referred to as exudates. These exudates are believed to drive the rhizosphere. The term ‘rhizosphere,’first defined by Lorenz Hiltner in 1904, is generally considered to be composed of three functional compartments, the ‘endorhizosphere’, the ‘rhizoplane’, and the ‘ectorhizosphere’. Plant roots secrete or release exudates, volatiles, metabolically active root border cells and additional polymers into the surrounding soil. It is estimated that approximately 10-250 mg fixed Carbon per gram root is released which represents between 10-40% of their total photosynthetic fixed Carbon. Field studies infer that the microbial community may be controlled by a few major plant alleles, rather than by many alleles of small effect located across the genome (Peiffer et al 2013). Therefore, understanding root biology and the root microbiome will lead to the ability to improve the coordination among these intimate communities to make intelligent choices in plant breeding for improved root function to improve water use efficiency, nutrient uptake, and pathogen inhibition over a range of abiotic and biotic stresses. This approach is clearly in line with the goal of the National Research Council, to achieve farming systems that are productive, profitable, energy conserving, environmentally sound, conserving of natural resources, and that ensure food safety and quality.